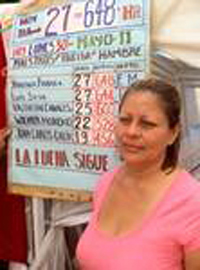 On Friday, November 18 2011, at 3:30, Honduran teacher Norma Yanina Parada Martinez will be in Chicago at Whittier Elementary meeting with teachers and local activists. This event, which is cosponsored by C.O.R.E (Caucus of Rank and File Educators) and TSJ (Teachers for Social Justice), is one of her many stops this week to report on the ongoing political situation in Honduras. Martinez is a member of two of the most active national teachers’ organizations in Honduras, COPEMH (Colegio de Profesores de Educacion Media de Honduras) and also the COLPEDAGOGOSH (Colegio de Pedagogos de Honduras). “She was also one of the teachers who launched a hunger strike in May 2011 for more than 30 days in protest of the teachers’ suspensions, and in support of the demands of teachers, students and families regarding the public education system,” Ms. Cervantes told Substance. "Her visit here shows another example of how teachers continue to take on corporatization of public education and services both here across our borders."